A Million Miles from Here Is Oz, by Chris Dulabone – I’ll bet you thought there weren’t any more Oz books I could possibly have left to read. Well, you thought wrong, but I AM running out of titles I haven’t yet read. Someone needs to let me know where I can find copies of The Silver Shoes of Oz, Mister Flint in Oz, and The Red Jinn of Oz. Anyway, in this book, the immortals of the Ozian world are losing their immortality. For some reason it falls to Winnie, a legal-minded bear from the Lunechien Forest, to save the day. One thing I appreciated about this tale was that it was actually kind of dark. Considering that Chris’s work often seems to be a bit on the twee side, it’s nice to see a serious threat. There are even two characters who die, and although they don’t stay dead (pesky immortals), the descriptions are still moving. That’s not to say that there isn’t a large dose of Chris’s brand of goofy humor as well, though. Our main humorous character this time is Remington, a rooster who avidly reads any book of religion or philosophy he can find. Queen Zixi of Ix is also here, as are many of the immortals who previously appeared in The Life and Adventures of Santa Claus. And yes, that includes Santa himself, who plays a significant role in the resolution. Speaking of which, I did find the ending a bit disappointing, if only because I thought an epic problem should be solved with more of an epic solution. Endings seem to be the curse of Oz authors, however, and at least this one was creative and tied in with the Russian Magic Land series. 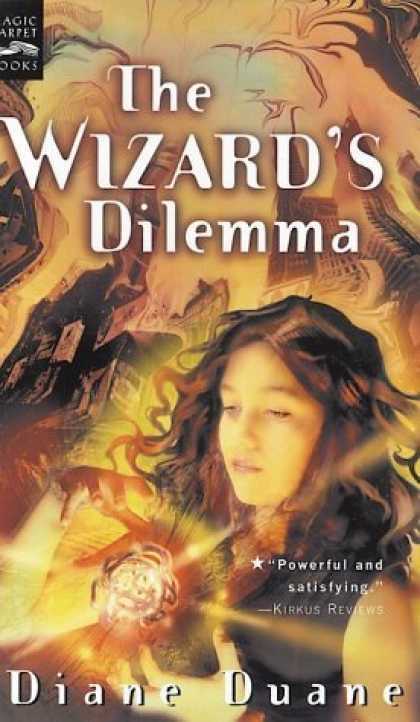 The Wizard’s Dilemma, by Diane Duane – Speaking of books that take a dark turn, this one involves Nita’s mother battling life-threatening cancer. There really aren’t too many ways to make a story more of a downer than by bringing in cancer, and that certainly applies here. While there were a lot of clever ideas here, including thoughts on alternate universes, creation, and respect for all life, I mostly just found myself wondering what the outcome would be. Good book, but rather depressing. This entry was posted in Book Reviews, Chris Dulabone, Oz, Oz Authors and tagged a million miles from here is oz, diane duane, magic land, queen zixi of ix, santa claus, the life and adventures of santa claus, the wizard's dilemma, young wizards series. Bookmark the permalink. Dang it, I have GOT to stop reading reviews of non-canon Oz books. Or actually finish something and get it published before this happens again. I might not let it stop me. You know, whenever I get around to doing something and all. I haven’t read Chris’s take on it, after all. Still, pffft. Well, the idea of immortals becoming mortal is probably common enough that I doubt your ideas would overlap Chris’s all that much. I’m pretty sure I had that same basic idea years ago, although I never went too far beyond that. Yes, but your one hit was a short story. You can also become a one-hit wonder in the novel field, right?